Frank Conlan, center, stands with Department of Delaware Commandant Chuck Landon and National Vice Commandant Bruce Rakfeldt. New York native Frank Conlon joined the Marine Corps in 1952. He served eight years in the Corps, as an air-traffic controller in the Air Wing. Conlon said he’s proud to have served as a Marine and enjoyed his time in the service. Conlon was recently named Delaware Marine of the Year, after being nominated by fellow First State Detachment Marine Corps League Marine David Kline Sr., judge advocate. “Frank has always presented himself as a true dedicated Marine and outstanding member and an asset to our First State MLC Detachment,” wrote Kline in his nomination letter. Kline explained that each detachment may submit two people they believe possess qualities to be named Marine of the Year. “The protocol is, if someone in the detachment feels that one of their members is worthy of the award, he has to submit a letter to the commandant. Then they have a vote of membership to make sure everyone is onboard,” said Kline. Kline noted that Conlon goes above and beyond in the detachment, not only collecting for Toys for Tots, but heading the organization’s yearly fundraising journal, organizing a fundraising golf tournament, and placing flags in the Millsboro Veterans Cemetery at Memorial Day and Veterans’ Day. He would later discover the Millsboro veterans cemetery and approached the staff about having the detachment place flags on the markers, as opposed to having staff do it. Kline also called attention to Conlon’s efforts with the detachment’s youth physical-fitness program, volunteered to walk in the Bethany Beach Fourth of July Parade, and is a member of the detachment’s funeral detain. Conlon was recently honored at the statewide meeting held at Heritage Shores. 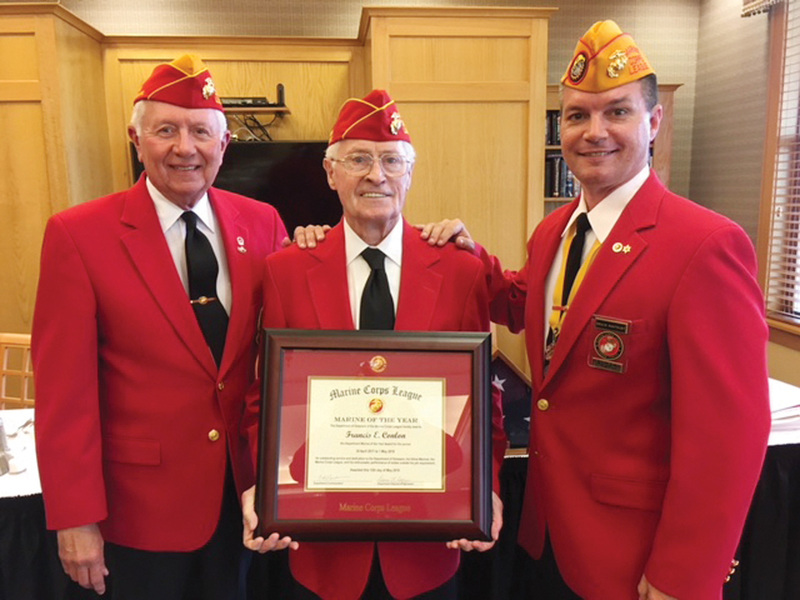 Being a part of the Marine Corps League is something Conlon has done for years, having been a member when he was living in Long Island. When he and his wife moved to the area in 2001, he immediately found the First State Detachment. “I went into the post office one day, and there was a poster on the bulletin board that said, ‘The Marine Corps League is looking for new members, and we want you,’” he recalled, noting the similarity to the Uncle Sam campaign of World War I. The primary purpose of the Marine Corps League is to preserve the tradition, promote the interest and perpetuate the history of the U.S. Marine Corps. “We’re the only branch of the service that has an after-military organization,” said Kline. According to the detachment’s yearly journal, in 2016, they were able to distribute 7,241 toys to 4,074 economically disadvantaged children in the area. “We put some major hours in with just Toys for Tots — you would not believe the number of hours,” said Kline. During the holiday season, the detachment has 30 donation boxes throughout the Bethany-Clarksville/Route 26 corridor alone. They also have boxes along the Route 54 corridor and in Ocean City, Md. “The community has been so generous to us,” said Conlon. The League also offers a physical fitness challenge to students of Most Blessed Sacrament Catholic School in Berlin, Md. “We would meet these kids in first grade and work with them all the way up… They looked forward to us coming. We ate lunch with them in the cafeteria. It was really a good thing for everyone — the kids, the school and the Marine Corps,” said Conlon, noting that the program was once available to Delaware students before the State stopped the program. The Semper Fi Fund was started in 2004, and since its inception, more than $160 million in grants has been distributed, with more than 20,000 soldiers and their families being helped. Kline noted that, at a recent Operation SEAs the Day event, members of the First State Detachment met a wounded veteran who had a service dog. “He came up and thanked us, because the Semper Fi Fund got him that dog,” said Kline. The detachment also helps wherever they see a need in their community, and even in other communities. Currently, the detachment has approximately 100 members, though not all of them are active. “We’re constantly trying to recruit new members, but it’s hard,” Kline said. Kline joined the detachment 11 years ago, as a way to support his community. Kline served two years in the Corps, spending 13 months in Vietnam, and was exposed to Agent Orange. Kline said that when he would travel to Florida yearly, he would stop at Parris Island (“where Marines are made”) and attend graduation. Kline said the Marine Corps League is always seeking new members to join their efforts. Those who are eligible to serve as full members, with the right to serve as an officer, appointed officer or vote on changes within the detachment, must be Marines who have served at least 90 days, Fleet Marine Force Corpsmen or Navy chaplains. Anyone in the community is welcome to serve as an associate member, though they cannot vote or hold office. Those interested in joining the First State Detachment Marine Corps League should contact Junior Vice Commandant of Detachment in Charge of Recruiting Rich Pounsberry at (302) 628-2624.